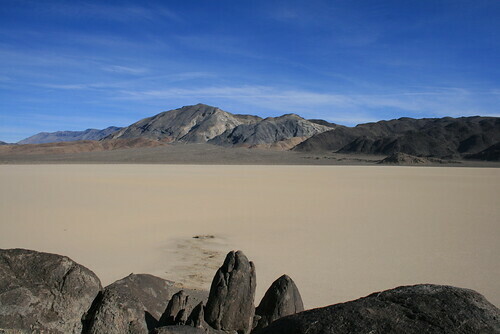 Basin and Range landscape in Death Valley National Park. Death Valley is literally being pulled apart, as is much of the Great Basin Desert. I'm no expert in geology, but the Great Basin has one of the most interesting stories in geologic time. At one time, long long ago, the area where the Great Basin now sits was lifted up. In Nevada, Utah, and parts of eastern California, tall mountains began to rise out of the earth 250-70 million years ago. Yet due to the ever shifting volcanic activity underneath the earth's crust, about 30 million years ago, the area which is now called the Great Basin Desert, began to be pulled apart. Mountain ranges which once stood next to each other began to slide away from each other due to the crust being extended. Huge deep and flat valleys formed while the mountains actually continued to get higher. The crust got thinner and thinner. In fact, it is still getting thinner as you read this. And the valleys are getting deeper and deeper as well. 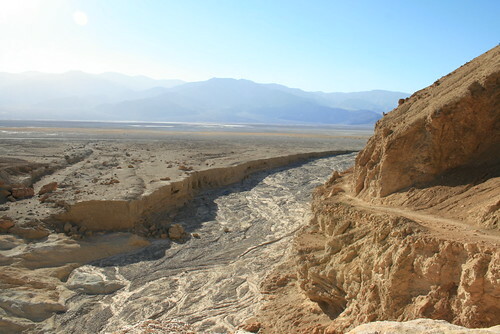 This type of landscape is typical of the Basin and Range Province, an area which includes Death Valley National Park. In Death Valley, we had to chance to see one of the tallest mountains, Telescope Peak (11,043 feet), rise from the lowest valley in the western hemisphere, Badwater Basin (-282 ft). This great difference in elevation is due to the crust being stretched out. 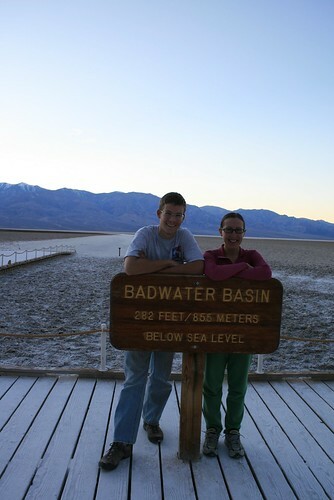 Badwater Basin is actually getting lower and lower. The debris that is washed from the surrounding mountains into the basin can't keep up with how fast the basin is dropping. The next big earth quake may drop Badwater Basin a few more feet below sea level! Jenn and Romy at Badwater Basin. 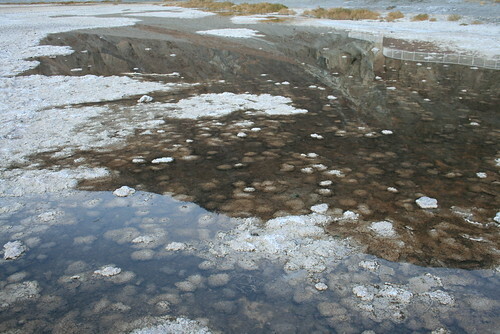 Salt saturated spring water in Badwater Basin. Playas also form in the basin area between mountain ranges. Playas are large flat areas where water flows and pools temporarily. As the water washes down the surrounding high lands, it brings with it dissolved minerals like salt. As the water pools and evaporates in the playa, salt is deposited in these flat plains. Racetrack playa is one of the most famous of these land formations because of the rocks which seem to leave mysterious tracks in the muddy playas. 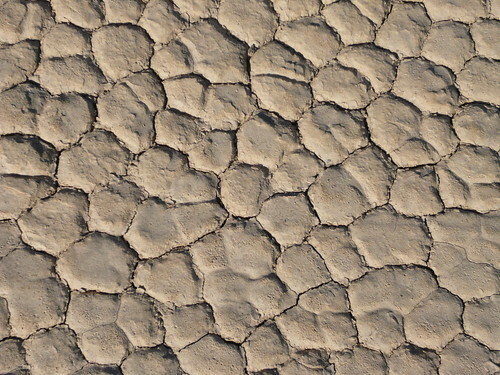 The dried surface of a playa in Death Valley National Park. 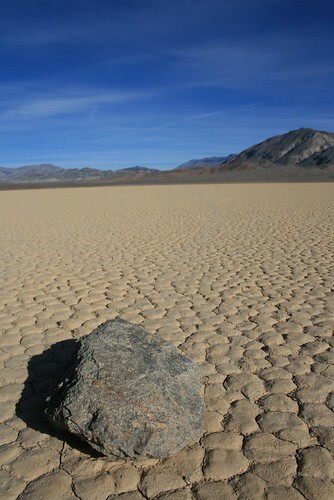 A rock leaves a trail in the mud on Racetrack Playa. The mystery behind the rocks at Racetrack Playa is that there is evidence that these rocks have moved, but nobody has ever seen them! Geologists have speculated that the extremely flat surface of the playa can get very slippery when it gets wet after rain. In addition, the mountains surrounding the playa act to funnel strong winds across the surface, pushing rocks across the mud. With little friction, the rocks can slide quite a distance before stopping, and during the process, they dig small but noticeable trails behind them. The extremely flat surface of Racetrack Playa.